Last week my wife and I accompanied Joe Cornish to a small cinema in Hyde Park, Leeds. Despite the strong temptation, we weren't going to see 'Kung Fu Panda 3D' and definitely not 'Hangover 2'. This was 'Joe Cornish 1' in a leading role in 'With Landscape in Mind', a production by Environment Films. Joe is only credited as 'presenter' but this is 'about' Joe Cornish and covers a few days early this year when Joe was accompanied by a cameraman and sound engineer on a photographic road tripd from East to West. I was unsure what to expect having been told by Joe that it tried to strike a balance between geeky photography stuff and a general documentary on the land and photography for the general viewer. It all starts with Joe on the East coast, working on the edge of the land and the edge of the human population; the edge of industry and the edge of his home turf. The Corus steel plant in redcar is a strange place for a landscape photographer known for his sublime and bucolic vistas. However, Joe's working practices take him to all sorts of locations, it's just that his gallery and the popular press have him type cast in many ways. The journey moves on, eloquently shot by Ben Todd, a cinematographer that knows his composition and light. This isn't a photographic tutorial video helping you to get your exposure right, it's a subtle engagement with a photographer relaxed in the familiarity of his craft. Joe is a natural orator and even despite his cold (although the ladies might like the husky voice), he communicates a relationship with the land that most other landscape photographers will recognise. The whole works very well, the only part that I was unsure initially about was a section where we are invited into Joe's train of conciousness whilst he is composing a shot. To be honest it was a little unnatural to begin with although by the time it finished it was working fine (and someone commented that they would have liked more of it!). The remainder of the film was with Joe talking on location or narration. I talked to Joe about the film and he answered a few questions for us.. The film comes across as a very natural portrayal of a photographer at work - did you worry that the film would be true to your approach? Yes. Worry in the sense that right from the start in discussions with Ben (the film's director and cameraman) we agreed that it should be as real and authentic as possible. Some 'artifice' is unavoidable in film-making; clearly, working with a cameraman who will sometimes need you to do something again or follow a particular walking line, is not the same as being out there on your own. Nevertheless, we pursued a normal working pattern to each day, essentially 'business as usual'. Certainly the photographs I made were, as far as I know, exactly what I would have done if the film camera had not been there. The concept was an absolutely authentic documentary, in which I could articulate some of my ideas and wider working philosophy both on location and via the device of the voice over. You weren't treated to the best of weather in the production of the film, would this be a typical week of your photography or were you commited regardless and just worked with it? Well, that is an interesting point. In some ways the film echoed how I work when I am on assignment in Scotland, where I am usually committed to be out and about with my camera, come what may. Most of the time on the film we were never more than a couple of hours from home so arguably without the obligation to the film crew I might have been tempted to 'bag it' and wait for better weather. interestingly, this was one of the pleasing outcomes of the film as one or two of the most interesting sequences are made in persistent rain, and they do show the benefits of persevering and working against the odds. Perseverance has often paid off in Scotland, especially in recent years with some of my most satisfying pictures being made in rain, or heavily overcast light. Anyway, aside from the proximity to home, yes it probably was a fairly typical working week. Your cameraman had a great eye for a picture himself. Do you think he'd have much of a future as a landscape photographer? Were you happy with the result and are there any things you would have liked to have had happen or done differently? I am very happy with the result, and I have no regrets whatsoever. It would be interesting to know how or whether it would have been more successful if the weather had been more benign, but in some ways I think the weather makes it and gives it a special atmosphere, and quality of light. I do believe we succeeded in creating a true and honest picture of a week in the life of a landscape photographer. The DVD will be available in the next few weeks (hopefully in the next week) and will be accompanied by a bunch of extras including some from Great British Landscapes where we discuss some of the pictures taken during the DVD. 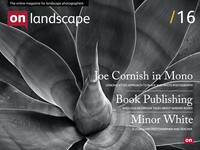 You can buy the DVD directly from the website at http://www.withlandscapeinmind.com/WLIM/DVD.html. Would I buy it? Yes, unreservedly. It's firstly rare to see landscape photography given such exquisite attention. It might not teach you lots of photography tricks but it will give you a window into a rare profession being practised by an accomplished craftsmen.